Eighty-four years and a day ago, The New Yorker magazine debuted in the United States. Its first cover featured a semi-serious drawing of a stereotypical northeastern aristocrat, who was dubbed "Eustace Tilley." In 2005, a New Yorker contributor wrote that it still wasn't clear whether the portrait's subject is being represented as a "cultivated observer of life’s small beauties, or...being ridiculed as a foppish anachronism?" Regardless, Tilly has become a sort of mascot for the publication. And since 1994, every year the magazine has invited artists worldwide to remix this drawing. Earlier this year, Camilo Ramirez of Colombia, finally finished his entry—albeit too late for entry into the 2008 contest. 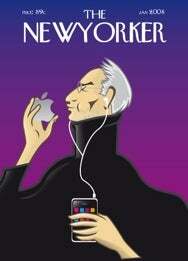 About a month ago, he posted his drawing: Steve Jobs as Eustace Tilley, pondering the Apple logo while clutching an iPhone. So the question remains: is the artist commenting on Jobs as a cultivated observer of gadgetry or mocking him for his peculiar personality? Although I'm no great art critic, I'd say neither. Or perhaps both. Either way, I applaud Ramirez's efforts and I'd love to have this mock cover done up as a poster.